August 12th – the ‘Glorious Twelfth’ – marked the start of the short season when grouse may legally be shot in the UK. For one month only during this season, until Sunday 14th September, we are proud to present Anthony Garlando’s #GloriousGrouse menu – a wonderful way to appreciate this prized game-bird. 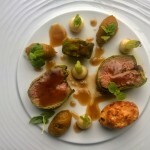 Using young, unhung grouse – which have a sweeter, softer flavour than the powerful gaminess of birds which have been hung – from moors in Yorkshire and Scotland, Anthony has created three dishes each using grouse in a very different way, which can be ordered individually or all together at a great set price. 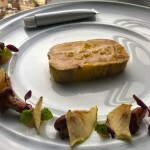 To start there’s a rich grouse & foie gras terrine with crab apple gel, served whimsically in a paint tube for guests to enjoy squeezing onto the plate, and piquant pickled wild mushrooms (£14.50). 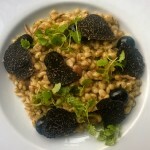 Pearl barley ‘risotto’ of grouse with blueberries and black truffle (£18) makes for an ideal intermediate course or light main. The sensational main course is Boned and rolled roasted grouse with Truebaby turnips, greengage & saffron marmalade and a grouse liver muffin, served with a raspberry vinegar jus (£29); grouse gourmets and guests new to game alike will love this clever, varied dish. If you’ve a sweet tooth – and room! – a raspberry Bakewell tart with summer truffle ice-cream (£7.50) will round things off beautifully. Available at dinner only, either individually as priced or all four courses for £65, this menu is exceptional value and a wonderful way to enjoy this quintessentially British delicacy. To book your table to experience Anthony’s #GloriousGrouse dishes, just visit the About Us page. Please note, game may contain traces of shot.